I never appreciated the sound quality fro this amp until I replaced it with powered speakers. I bought it 3+ years ago off ebay for $250 + shipping. I've been using it since to power my JBL 4408 studio monitors. Sounded great, and have received countless compliments about the sound in my little studio. In todays world it's more typical to use powered monitors in this application. So I recently bought so KRK 8" powered monitors and took amp two and JBLs out of service. The KRKs also sound great but no better. I only stumbled on this site by researching to get some data for listing my amp two in ebay. Glad I found it. Good info. I only guessed year 2000, I purchased used and haven't a clue of actual age, maybe newer. Mids aren't as lush as I like until you ad tubes into the mix then stand back. Meters aren't dependible (I don't have any problems with mine)as they should be. Not the most powerfull. If you want something to bring the walls down, go elsewhere. Well worth the money. I've had this amp for over a year and it has performed flawlessly. I have it in the living room in a simple 2-channel audio setup (no TV in the room). Clean, pure music. Sure you can spend more, but you'd have to spend close to a $1000 to get a better amp. This is a wonderful amp for the money: an oustanding value, period. With good speakers and a music source (I use AH! Njoe Tjoeb 4000 CD player and Polk Audio RT600i speakers), this amp will perform very well, though, of course, it can be bettered, for more money (but only if it is carefully - and lavishly - spent). Staging is good, distortion negligible, transparency very good. In value, this is surely a 5 star product. In quality, the amp represents the point where audiophile reproduction of music may be said to take off. My tube CD player sounds warm, with instruments well resolved and delicate, rewarding detail showing up where it would get lost in a lesser system; there is depth and enjoyable complexity to the sound. 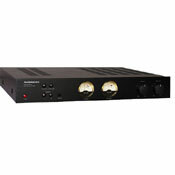 This amp also functions somewhat as a preamp with its separate volume controls and a CD IN; if all you need to connect to your system is a CD player, then you don't need a separate preamp (but there is no remote and you have to adjust each channel's volume separately (the knobs work nice and smooth) - you may choose to adjust volume with your CD's remote in such a case). I do not agree with the previous reviewer that a CD will sound bad if directly plugged into this amp (unless there is some incompatibility between the two components) - my set up works very well, and distinctly better, cleaner that if I plug in my substandard preamp Audiosource PreAmp ONE/A (read my warning below). As stated by AudioSource, CD IN and LINE IN cannot be used simultaneously (meaning you cannot plug in two things at the same time, not just play two things at the same time) - if you try, the sound will be terrible. I do not know why there is a separate CD input, and the manual does not explain what are its advantages or its special purpose, though I might guess that some CD players may perform better if connected to this dedicated input rather than the standard LINE IN (the manual states that LINE IN is to be used with inputs from a preamp, CD, tuner, etc.). Warning: do NOT use this amp with AudioSource PreAmp ONE/A, which is a low audio quality component that only appears to go together with this amp, and may fool one into believing that it represents a similar standard and a match. This slim component looks quite elegant. I have no idea whether the meters display correct information, but they are surely too bright in the dark, which is the only minus in the appearance category. The inputs and outputs are, unfortunately, not gold plated. Even for these two reasons I will NOT take a star off the overall rating for this amp, because this unit is so unexpectedly good. Don't shy away from it if you are looking for a solid quality component while watching your budget - with this amp you'll be able to afford a better CD player and/or speakers, which is the way I went, since no matter how much you spend on an amp (or a preamp), they will not compensate for the lousy reproduction of music either at its source or, even more importantly, at the point where it actually becomes physical sound waves for our ears to enjoy. Too dependent on the preamplifier, cannot produce good sound by itself, but only with a good preamp. The Amp Two is a pretty decent amplifier, that is if you have a decent preamp. The Amp Two has line level inputs, so you can plug your source directly into it. However, if you do this, be prepared for *extremely* horrible sound (perhaps the voltages or impedances do not match? I do not know). However if you have a good preamplifier (particularly some vacuum tube stage in your equipment chain – I use a MG Head DT vacuum tube headphone amplifier), then the sound out of the Amp two sounds pretty much what your preamp sounds like, which in my case is quite good (SIGNIFICANTLY better than skipping the preamp, it really is like night and day). So, I'd say the Amp two just amplifies what goes into it and does not really create much to the sound. Perhaps it really depends on how you match your system, but I believe that the preamp is vital. Oh and be sure to turn the stupid auto off thing off, if your preamp's voltages do not match properly with the Audiosource's input voltages, then it will turn off by itself too much. None, but a dual-gang gain control in place of the two separate knobs would be handy. I was reassured by how heavy this unit is when I got it out of the box. The fit and finish is perfect for this price bracket. The clicking and switching that happens when you turn it on is satisfying, in a strange way. This amp has satisfying meat to it. I was having a good time pushing it, and it did not break a sweat. I suppose you might hear some congested mids and highs if you A/B'd it against a megabuck amplifier through some B&W 801's, but I am quite satisfied. Five Stars AudioSource. Being in music and a broadcaster for over 30 years I have heard the best of the best and for what I paid at Sound City, Amp Two is a jewel. I am listening right now to the Mother Wurlitzer on my Klipsch Heresy 2 monitors and the sound is correct and to my way of thinking right on! When I add my Velodyne ULD15-2 the bottom will be there and I will have the best for well under what my former phile system cost me. The bells, the cymbals, the 8' stops are natural and that is what audio is all about. Oh! Someone said the meters are like headlights. Get Real! They are just right! And to think I was considering Monarchy and Krell! Save your money and enjoy the Amp 2! I am using my Creek OBH-10 for a pre and Nak OMS-7AII CD player and the Amp 2 and the Heresy 2's and I am in sound heaven. I can't wait to put my favorite style of music on JAZZ! Auto stanby. Price. Can be used with or w/out preamp. A+B speakers. Size. Nice dual VU meter. Button to prevent the speakers from exploding. Review for Amp Two. I hate to disagree with lots of the reviewers, but this amp sounds like a $220-amp. I cannot hear anything spectacular from it so far. After the burn-in, still nothing. Don't get me wrong, this is a nice amp and fairly inexpensive for something more or less minimalist. I am waiting for my new preamp (tube preamp) to see any improvement from it. Nonetheless, amp two sounds nice, however, not as clear, crisp or warm as I would expected. ....I would recommend it to anyone. Slim, strong sound throughout the freq.range and quite clean. bridgeable. Slim for easy placement. No need really for a preamp. Sturdy. Some reviews below are quite pointless and clueless,,, read between the lines: ""The Amp 2 just kind of plays the music back for you,but it does not sound exciting. "" Now, it just me, or isnt that was a great amp is supposed to do. Some people attribute too many sonic properties to their amps. I wonder if he wanted it to make coffee also. I bet you in blind tests, this amp stands a lot closer to the amps mentioned in his review. Guys: stop being audiohillacly ( imad ethat word up) blind by biases. my other equipment is a Parasound CDP-2000 Ultra, Mission 774 speakers, MIT T2 speak cables (biwire), and a Musical Design PB-2 tubed preamp.